Polka dots, bright colours, fun designs....what do they remind you of? dresses?...well you are wrong! Today we have the most fun shop, with the beautiful and quirky soaps!! Trust me...you are gonna love them!! Linda here...shares with us, the beautiful story of how it all started! Trendi Soaps started in a pretty unlikely place… as you may know, the FIFA Soccer World cup of 2010 was held in South Africa. My son Aidan, became obsessed with trying to create the South African Flag completely out of soap ... and finally, after many attempts, he succeeded. Seeing that first bar was amazing. Neither of us had done any soap-making before this. When the initial process for the flag was worked out - it was then possible to use the same principle to make other soaps: polka dots, lattice and african design soap. These are the ones I enjoy making the most! I have tried to reflect the colours of Africa, the muted shades of the bushveld and also the bright jewel colours and patterns of Ndebele hut decoration. All the soaps have the design going all the way through, so even the flag stays the flag until the very end! Each soap is made in stages from vegetable glycerin soap base .. and using the melt and pour method. I work from home and have a lovely lady from the Eastern Cape - Phumla, that I have trained to help make the soaps, as I now also have a stall in the craft market at the Victoria and Alfred Waterfront here in Cape Town. - What is your favourite part of creating beautiful and fun soaps? 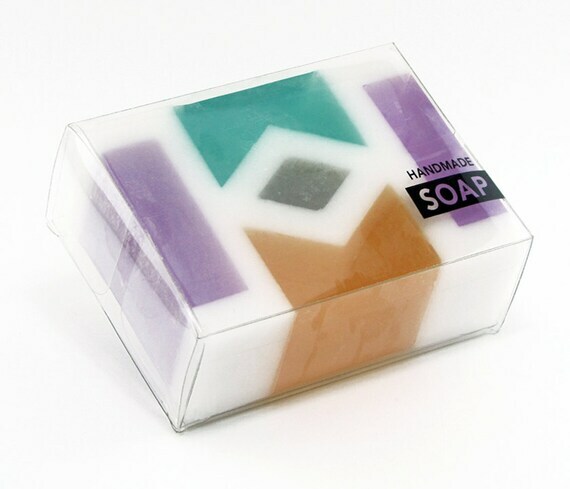 L: My favorite part is working out new colour combinations and seeing this translated into soap. For Etsy I stick to a certain range - but for my Waterfront stall I am experimenting with new combinations all the time. L: I have always been artistic - my mother and daughter are both artists - so it runs in the family. But I never thought it would be expressed in soap making. L: I love the Taupe and white polka dot soap the most. L: I really don't have a normal working day - each day is different! Now that we are coming up for the main tourist season here in Cape Town (October to March) I am working day and night to make stock for my stall. I take turns with Aidan sitting in the market - supervise Phumla early in the mornings before I leave home, and make soaps at night when I come home. 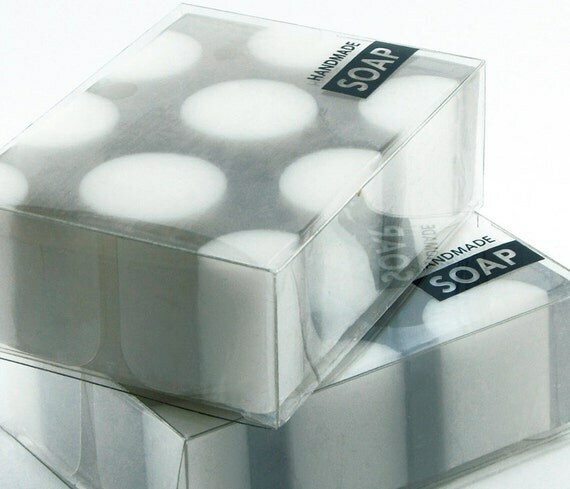 L: Our first order on Etsy was very special - but the best moment was when someone featured one of my polka dot soaps on Pinterest and we got a huge surge in traffic! So if you are in Cape town...you know where to drop by! how cool and how cute! i'm going to have to remember these the next time i need a fun gift for someone!